[AUTO] [(1) Put a <<Music>> character from your stage into your waiting room] When a card named "Tokyo Teddy Bear" is placed on your climax area, you may pay the cost. If you do, choose a <<Music>> character with a level equal to or less than your level in your waiting room, and put it on any position of your stage. 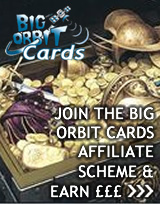 [CONT] If the number of cards in your deck is five or less, this card gets -1 level while it is in your hand. 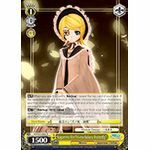 [AUTO] When this card is placed on stage from your hand, all of your characters get +1 soul until end of turn. 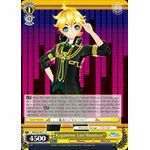 [CONT] This card gets +500 power for each of your other characters with "Rin" or "Len" in its card name. 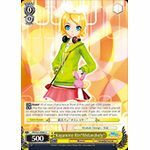 [CONT] If this card is in the middle position of the center stage, this card gets "[AUTO] Encore [Put a character from your hand into your waiting room]". 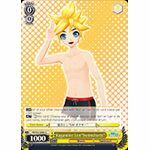 [AUTO]  When this card attacks, if a card named "Fire Flower" is in your climax area, you may pay the cost. 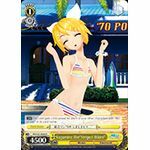 If you do, choose another of your characters, and that character and this card both get +4500 power until end of turn. 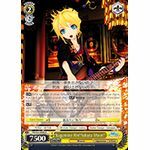 [CONT] If the number of other <<Music>> characters you have is three or more, this card gets +1000 power and "[AUTO] Encore [Put a character from your hand into your waiting room]". 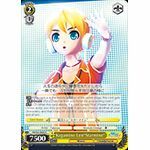 [AUTO] [(1) [REST] two of your [STAND] <<Music>> characters] When this card attacks, if a card named "Tengaku" is in your climax area, you may pay the cost. If you do, choose one of your opponent's cost 1 or less characters, and put it into your opponent's stock. 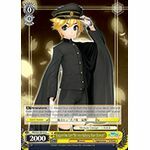 [CONT] If the number of cards in your stock is four or less, this card gets +2000 power. [AUTO] When this card is placed on stage from your hand or by a "Change" effect, you may put the top card of your clock into your waiting room. [AUTO] [Put the top card of your deck into your clock] When this card is placed on stage from your hand, you may pay the cost. If you do, choose one of your <<Music>> characters, and that character gets +1 soul until end of turn. 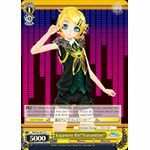 [CONT] All of your other characters with "Rin" or "Len" in its card name get +500 power. 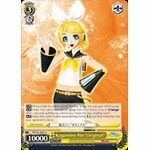 [ACT] [[REST] this card] Choose one of your characters with "Rin" or "Len" in its card name, and that character gets +500 power until end of turn. 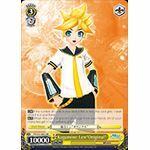 Kagamine Len "Ni-no-Sakura Fan Dance"
[ACT] Brainstorm [(1)] Reveal four cards from the top of your deck, and put them into your waiting room. For each climax revealed, choose one of your characters, and that character gets +2000 power until end of turn. 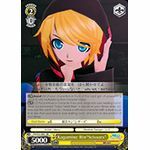 [AUTO] [(1)] When this card attacks, if a card named "Remote Controller" is in your climax area, you may pay the cost. 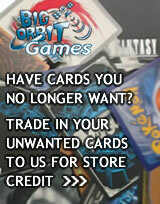 If you do, choose one of your opponent's characters, and return it to your opponent's hand.